and offshore of Nokomis, Florida. 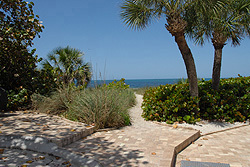 Just steps to the private Gulf beach. Free high-speed wireless internet access. Located on the ground floor, these Casey Key efficiency vacation condo hotel rentals open into a beautiful tropical courtyard and include a queen-sized bed, VCR/DVD player, full mini kitchen with 4 burner stove, oven, refrigerator, microwave, toaster, coffee maker, all utensils and services, table with chairs, and a private bath with shower. While these units only have a partial Gulf view from inside the unit, you can also see the water when you step outside your door as the tropical courtyard opens directly onto the beach. These condos sleep up to 2 people and have been recently renovated including granite countertops, designer cabinets, new bathroom fixtures, tile floors and showers, new furniture, and brand new appliances. 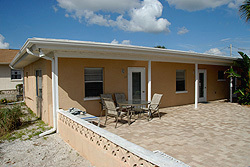 In addition, A Beach Retreat has been completely renovated. Condos also come equipped with free high-speed Wi-Fi wireless internet access. You must provide your own compatible laptop computer. For those renters traveling without a laptop computer, there is a computer in the nearby rental office for your use during normal office hours at no additional charge. Casey Key is an eight-mile-long tropical island just offshore of Nokomis located north of Venice and south of Sarasota, Florida, joined to mainland by two bridges including a historic pivot bridge or swing bridge dating back to the 1920's. One of Florida's most prestigious addresses is Casey Key. 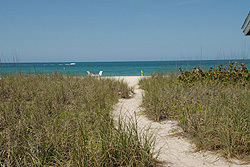 Its privileged residents dwell on this narrow island south of Siesta Key, between the Gulf of Mexico and Blackburn Bay. Homes here exude a unique blending of wealth, elegance and "old Florida" charm. Conservative, tasteful architecture reigns supreme, with few exceptions. It is no wonder that a number of celebrities reside here such as Stephen King. You can enjoy Casey Key's uncrowded natural beaches on the Gulf of Mexico with protected wild sea oats and mangroves providing a habitat for the scores of native island birds that share the island. There are dolphins, manatees and other wildlife living just offshore. Casey Key offers an ambiance and privacy that is unmatched on the Gulf coast and you can also enjoy the spectacular sunsets on the Gulf of Mexico. Even though Casey Key is semi-secluded, there is plenty to do including swimming, fishing, boating, shelling, snorkeling, diving, sailing, jet skiing, picnicking and much, much more. Living on Casey Key provides an island atmosphere and lifestyle, yet the amenities we all enjoy like major grocery stores, drug stores, and department stores are just minutes away. In addition, top restaurants, golfing and tennis are nearby. 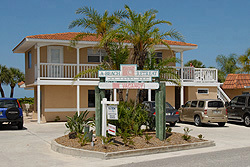 Getaway resort vacation condo hotel rentals can offer privacy and amenities not found in other typical vacation lodging accommodations such as hotels, motels, villas, inns and other Venice / Nokomis condo hotel rentals. Sarasota Bradenton International Airport and airports in Tampa and Fort Myers are an easy drive from Casey Key / Nokomis / Venice Florida. For more information about the Casey Key / Nokomis, Osprey, Laurel, Venice and South Venice Florida area visit the Venice Area Chamber of Commerce web site. A Beach Retreat was chosen as one of the best staycation spots for Sarasota-Manatee county by the Sarasota Herald. For full content of the article click here. 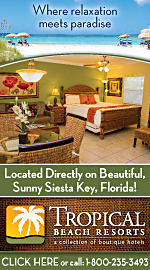 To bookmark the Casey Key Vacation web site for easy recall access click here. Member of the Venice Area Chamber of Commerce. Web site designed and maintained by Casey Key Vacation.